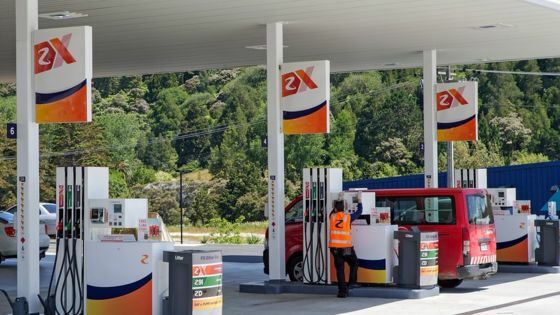 Several petrol stations in Auckland have been hit by fuel shortages as problems caused by damage to a pipeline in New Zealand`s largest city spread. Z Energy confirmed to the BBC that 13 service stations had run out of 95 octane petrol by Tuesday. The firm said fuel was being trucked into the city and it did not expect the problem to worsen. Fuel supplies to cars and planes in Auckland have been disrupted after the pipeline burst last week. It is believed to have been damaged by a diggeron a rural property and its operator, Refinery NZ, said on Monday repairs could take at least a week. It all comes in the final days of a tightly contested general election campaign. The government had said on Monday it was unlikely drivers would face fuel shortages. Fuel rationed Z Energy, the country`s largest fuel supplier, moved to reassure motorists in a statement on Monday that further disruption to 95 octane petrol supplies would be limited. "All grades of fuel are being trucked into the city and there is no cause for concern," the company said. Initially only four petrol stations were affected by the shortage of 95 octane - a premium unleaded fuel - but that had risen to 13 by Tuesday. Other grades of fuel were available. Thousands of air passengers have also been stranded as the damaged pipeline is the only source of fuel to Auckland airport. Supplies have been rationed and airlines forced to make stops at airports in Australia and the Pacific to refuel. Air New Zealand said on Monday fuel supplies at the airport were down to 30% of normal capacity. Qantas, Cathay Pacific and Emirates are among the other carriers affected. The New Zealand Herald reported on Tuesday that government staff had been directed to cancel all non-essential air travel to help relieve the pressure on fuel supplies. Pipe repairs The military has been trucking fuel supplies around New Zealand in an attempt to ease the shortage, as repairs to the burst pipe continue. Refining NZ said in a statement late Monday that it was on track to repair the pipe and resume supply services between 24 September and 26 September. Damage to the pipeline may have occurred months ago, near Ruakaka and the Marsden Point refinery, about 130km (80 miles) north of the city. But it burst on Thursday, possibly due to an exploratory search for a valuable swamp log according to the New Zealand Herald. The building of a new section of pipe has been complicated by heavy rains and safety concerns. The Green Party and environmental advocacy group Greenpeace were among those that expressed concern about potential contamination of the surrounding land. Refining NZ said water testing undertaken "indicates that there has been no contamination of surrounding waterways.